I recently taught a couple of classes on managing blood glucose levels. One of the recipes we cooked together was a Tuscan dish called Castagnaccio. 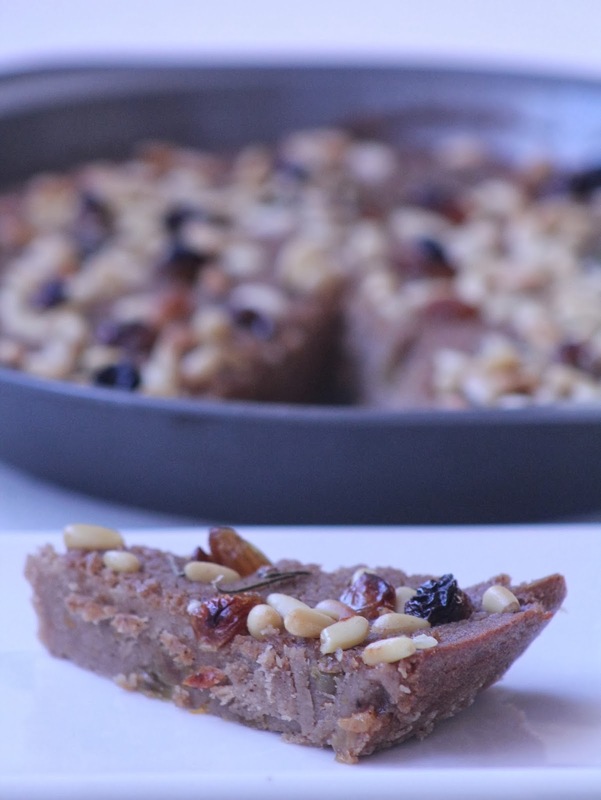 Its a sweet/savory cake made with chestnut flour and no added sugar. This winter I've actually had a bit of a chestnut obsession, to be honest. I just love chestnuts and keep finding new ways to use them. I think I'm just going to have to find space to plant a chestnut tree. 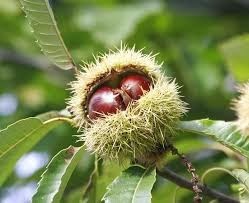 Edible sweet chestnuts - not to be confused with horse chestnuts, nor water chestnuts, are in the beech tree family. They are one of the lowest calorie nuts, containing no cholesterol, very little fat (mostly unsaturated) and gluten free. They have similar carbohydrate content as rice and wheat and are the only nuts to contain vitamin C. We always think of nuts as being high in fat - but not the chestnut. I throw them on my salads, add them to lots of other dishes and now am using chestnut flour in baked goods. You can also buy them dried and reconstitute them, and pureed, and as "chips" which you can use to make a chestnut type hummus. See - they are so much more than just a subject of Christmas songs! 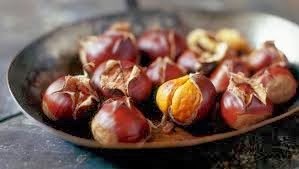 Get out there and buy a jar of roasted chestnuts - or roast your own, before they are all gone! Castagnaccio is a little different from what you imagine a cake to be. It is solid with a more unusual texture - and combines the flavors of sweetness from sultanas (golden raisins), with pine nuts and then fresh rosemary. I love the combination - but I have to say, I haven't tasted anything else quite like it. I've tried a couple of variations using walnuts instead of the pine nuts and regular raisins or cranberries instead of the sultanas. And with or without the orange zest. I like them all and its a great portable food that I take with me in the car on my trips to the city. Soak the sultanas in the 1 1/2 cups warm water for approx 5 minutes. Drain - reserving both the sultanas and the water. Meanwhile, remove the rosemary leaves from the sprig. In a medium bowl, whisk together the chestnut flour and drained warm water until smooth. Place the olive oil in a pie dish and place int he oven to just a couple of minutes to warm. Pour the batter into the pie dish and swirl with a whisk to carefully mix in the oil into the dough. Sprinkle on the nuts, orange zest and soaked sultanas. Bake in the oven for about 25 minutes until the whole surface is dry and a little cracked.